It takes more than willpower to beat an addiction to drugs. Science shows that an addictive drug triggers complex physical changes in the brain, and these influence a person’s behavior, making it hard to quit. The most significant changes take place in the nucleus accumbens, a region of the brain that scientists recognize as the reward center. 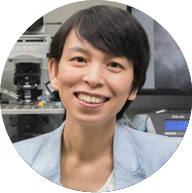 Yao-Ying Ma, assistant professor of psychology at Binghamton University, wants to understand how those changes work at the cellular level. She hopes that a more precise understanding of those mechanisms will lead to therapies that reverse the effects on the brain and help to cure drug addiction. At birth, the brain is filled with immature synapses that barely pass information among neurons. Stimulation from the outside world prompts some of those synapses to mature. Although most of the surplus immature synapses are pruned soon after birth, about 5 to 10 percent of synapses left in the adult brain are immature, or silent. “This could be a good thing, since it provides the potential to quickly learn new tricks through our life experiences,” Ma says. That is, unless the brain is exposed to an unusual stimulus, such as an addictive drug, which can regenerate silent synapses in our brain. When this happens in the adolescent or adult brain, the drug-induced silent synapses gradually wake up and grow in a way that elicits intense, abnormal communication among certain neurons. That leads to compulsive behavior such as drug addiction. To study this effect, Ma and the students in her lab employ an animal model — rats prenatally exposed to alcohol, which puts them at high risk of addiction to cocaine or other drugs. For example, in one set of experiments using both brain slices and live animals, researchers direct light within specific wavelengths to a synapse, switching certain receptors on or off, and then observe the outcome. When the researchers work with live, addicted animals, they can see whether specific kinds of stimulation calm the synaptic storm. Once researchers learn which patterns of light waves — or other kinds of stimulation — might counteract the effects of addictive drugs in the brain, the next step in the search for effective therapies will be to learn how to target the correct synapses, Ma says. Ma joined Binghamton’s faculty in 2015 after conducting postdoctoral research at the University of California, Los Angeles and the University of Pittsburgh. She has already attracted significant external funding. Her current and pending grants, totaling $1,655,000, come from the National Institutes of Alcohol Abuse and Alcoholism, the Brain and Behavior Research Foundation (NARSAD) and the National Institute of Neurological Disorders and Stroke. Ma has also won accolades for the time and passion she invests in her students’ success. She was one of 74 people recognized as Career Champions in November 2016 at an event sponsored by Binghamton University’s Fleishman Center for Career and Professional Development. As a teacher and mentor, Ma says she takes an individualized approach, letting her students and postdocs tackle the challenges they find most appealing.